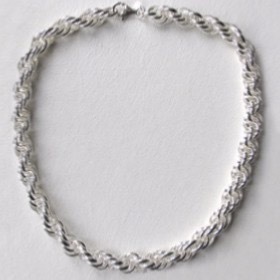 A silver chain necklace can be a single strand or an elaborate necklace. Below you will find the most popular silver necklaces from a sleek silver snake necklace to a sparkling crystal mesh necklace. Most of our sterling silver necklaces have matching silver bracelets and silver earrings. Our silver necklaces are available in a multitude of widths from 1mm to 2cms and lengths 14" to 40" so there's definitely one here for you! If you are unsure which length you need, read our Guide to Chain Lengths. Free delivery on all sterling silver necklaces. Italian sterling silver ball necklaces. Lengths from 16" to 36"
Italian sterling silver popcorn necklaces.